Long Beach, Calif., Dec. 12, 2013 – The new Rancho 2014 GMC Sierra 1500 suspension systems recently passed the U.S. Federal Motor Vehicle Safety Standard No. 126 – Electronic Stability Control Systems (FMVSS-126) test – and were engineered to accommodate the varying steering knuckle materials being used by GMC. The truck that recently passed FMVSS-126 included the new 6-in. 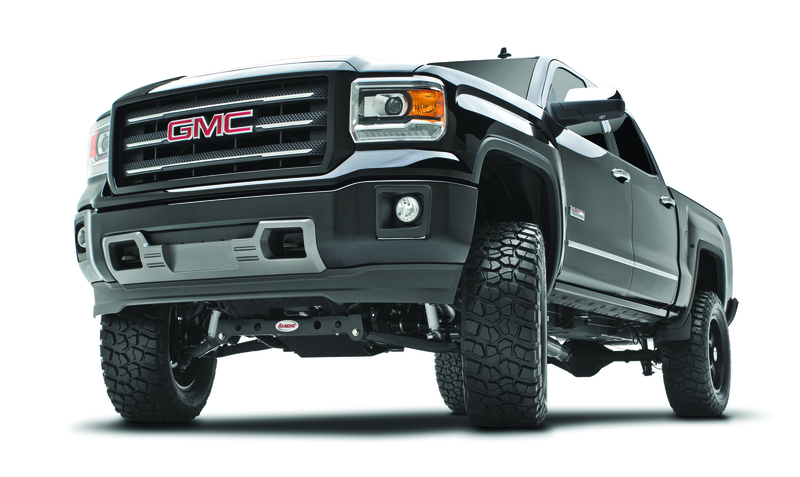 Rancho suspension system, rear Rancho® RS7000MT™ (RS7297) shocks, and front OE struts with spacers. The truck also was outfitted with BFGoodrich® Mud-Terrain T/AKM2 325/60R20 tires and 20-in. Vision Off-Road Assassin wheels finished in matte black. The new systems include an entire host of components that help preserve performance while lifting the vehicle for extending off-road capabilities. The new systems feature a one-piece sub-frame for a precision-matched fit and added strength; high-clearance aft braces to maximize ground clearance; front differential drop brackets that correct pinion angle to help minimize driveline vibration; and extended-length, DOT-certified front brake lines. The kits are available in two configurations to match the OE steering knuckle material, including Rancho engineered and fabricated extended steel knuckles (RS66301B) or aluminum knuckles (RS66302B). The Rancho systems were designed for a fast, easy install – Rancho engineers maintained OE-quality steering precision by maintaining the factory’s rack and pinion location and preserved OE geometry for minimal bump steer. No drivetrain or exhaust modifications are necessary. The kits include highly detailed, illustrated instructions. All Rancho brackets are manufactured using high-strength, low-alloy steel. Any of the Rancho performance shock absorber series (RS9000XL™, RS7000MT™ and RS5000™) work with these systems. The Rancho Sierra systems are backed by the Rancho brand’s limited lifetime warranty, see www.GoRancho.com for additional details. Rancho is headquartered in Long Beach, Calif., and is manufactured and marketed by Tenneco Automotive Operating Company Inc., a subsidiary of Tenneco Inc.
To learn more about Rancho performance products, contact your nearest Rancho dealer, call 1-734-384-7806 or visit www.GoRancho.com. To locate a Rancho authorized reseller, visit the “Where to Buy” tab on www.GoRancho.com. Tenneco Inc. (NYSE: TEN) is a $7.4 billion global manufacturing company with headquarters in Lake Forest, Illinois ands approximately 25,000 employees worldwide. Tenneco is one of the world’s largest designers, manufacturers and marketers of clean air and ride performance products and systems for automotive and commercial vehicle original equipment markets and the aftermarket. Tenneco’s principal brand names are Monroe®, Walker®, XNOx™ and Clevite® Elastomer.